The basic concept behind the BFR is to make a single booster and ship that could substitute the company’s Falcon 9, Falcon Heavy, and Dragon. This would let SpaceX to pour all the assets at present divided across those three crafts into the one project.Once finished, the BFR could be utilized to launch satellites and space telescopes or clear space debris. It would also be able to dock with the International Space Station (ISS) for the supply of cargo. Most extraordinarily, however, is the BFR’s potential to assist the establishment of off-world colonies. Musk’s ambitions go well beyond the Moon, however. 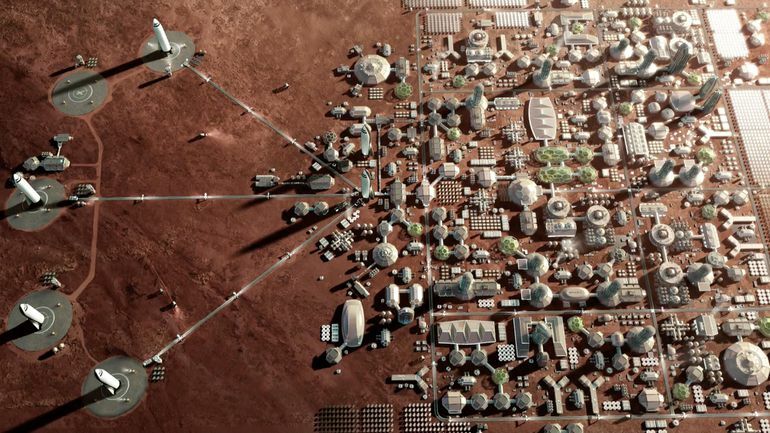 SpaceX’s goal of journey to Mars as soon as they have the resources to do so is well known, and in last night’s presentation, Musk shared images of a fully-fledged Martian city. Construction on SpaceX’s first ship able to head to Mars is projected to start within the next nine months, and Musk hopes to send a pair of cargo ships to the planet in 2022, however he confessed that this goal is somewhat “aspirational.”In 2024, SpaceX would send astronauts to the Red Planet on-board two crewed BFRs. These first “settlers” would make a fuel plant that would work as the start of the Martian colony. After that, the plan is to construct multiple landing pads, then enlarge out into terraforming and the construction of an urban environment.